Will players always restart from the first stage? What about power-ups? Click to find out. The developers at OrangePixel love old school arcade games with retro graphics, which is evident the moment you see their iOS and Android efforts, from platformer INC to vertical shoot-em-up Neoteria. The studio's newest creation, Chrono&Cash, continues this tradition, with a simple-to-grasp concept, intensely challenging play and of course, a copious amount of pixel art. That said, we happily made Chrono&Cash our Android game of the week last Friday, and on that note, we also tracked down OrangePixel's Pascal Bestebroer to learn more about the future of this entertaining title. What was the inspiration for Chrono&Cash? Did Super Crate Box factor into the game's development? It seems like fans have a short list of features that could potentially make the game better. Anything stand out? We've seen calls for weapons and power-ups. We are looking at some features, but weapons and jumping-on-heads won't make it in. This is simply not that type of game, and it would mess things up completely. Power-ups and some sort of time-bonus are two big changes we are looking at right now. It seems we can't launch Game Center from within the app. Is there a fix in the works? It's in the first update, currently waiting approval on that App Store, and just put live on Google Play. What are you most proud of with this game? Conversely, what needs more attention? I'm most proud of the gameplay. I keep coming back to it, and have been playing this game for over three months now. The thing that needs more attention is the content. 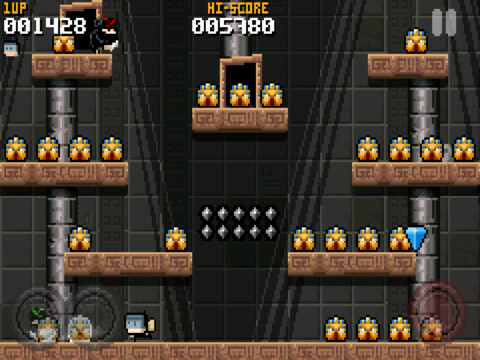 Adding new levels is simple, but it doesn't work in a game where you always start at the first world. We are looking into some random-start option where you run through the levels you unlocked, but I'm not sure if that will make it in. To that end, what are your DLC plans? Current update comes with a new level, six new challenges to increase your score-multiplier up to seven times and a new unlockable disguise, so those are our plans for now. The iOS update should be live within six to seven days from today. Android players, meanwhile, can already enjoy the new challenges, level and disguise.